I noticed a few fishing posts in my blogroll and didn't realise that Martha had put up this week's Blog Azeroth shared topic, about my favourite profession in game! I am in the "I love fishing" boat - pun intended! I have been an avid fisher in game for a long time - it's one of those things that I find really relaxing and good for passing the time while I'm concurrently doing other things. I actually enjoy fishing IRL too (but only to eat what I fish - not really much of a sports fisher where I catch big game fish and throw them back), so maybe that's why I like it. You can tell how much I love fishing because Salty is my title, and has been for a really long time. I think it's been my title of choice for the last 3 years. 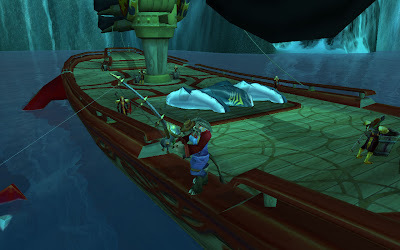 One of the biggest fishing achievements I was proud of would have to be winning the Fishing Tournament in Stranglethorn Vale. I remember when I won it, I was so excited! I have forgotten exactly when I won it, but I am pretty sure it was in Vanilla because I don't recall thinking there were "lowbies" about. The Arcanite Fishing rod was very ordinary looking back then, but had an upgrade to its look in the last year or two and now looks a lot more epic (well, for a blue item!). Fishing up pets and mounts was NOT my strong point. 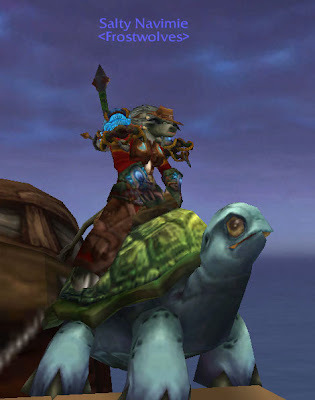 It was only recently that I managed to get my turtle mount, and I moaned about the fact that I fished more than most people before I got it. I had a post on it here - it took me 12293 fish caught from pools before I got mine. Of course, some of those were fish caught before there was a turtle to catch, so that number may have some fish that were caught before the achievement came out. And who could forget Old Ironjaw? For anyone who thought fishing was boring and safe, fishing in our enemy city of Ironforge is surely one of those times you DON'T want to AFK while fishing. 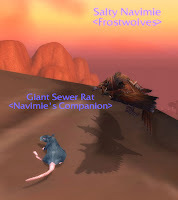 I would spend many hours nervously watching the Alliance passing by, hoping they didn't see me at the far end of the pool trying to get that stupid fish. And I do remember the time I caught it, it was raid time, and I was being summoned, and I thought I'll just get one more cast in and BAM! Fish! Achievement! Woot! Take that summon before those Alliance who are standing over there looking at you come and gank you! Wheeee, Advance to Go, collect $200. And Sea Pony. 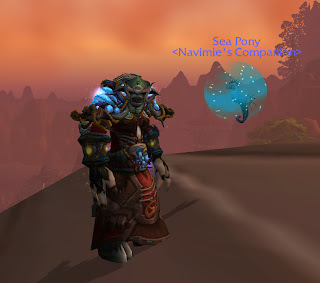 I remember everyone getting the Sea Pony, and telling me where to fish. Another one of those bloody piece of crap drops that I was bad at getting. I got it after about 1000 casts, I think. Boy what a relief. 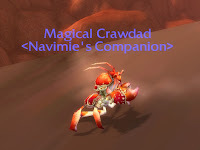 So I should show off my Magical Crawdad and Sewer rat? I admit that Mr Pinchy was not that difficult because I did spend a lot of time fishing in Skettis for those crawfish anyway for buff food for raids for my husband, and the Magical Crawdad was a nice surprise! But I wasn't actively trying to get him, merely hoping I would get lucky. And I have caught that box a few times too... The Sewer rat was a different story. I spent many hours fishing - surprisingly I didn't blog about it. Lushnek was fishing on his hunter (Huntinhk) with me just to keep me company and he caught the rat... it took me many long hours of fishing after that to get the rat, but that was typical of my kind of luck! Oh and my favourite fishing spot... well, it's not my FAVOURITE, but I do have sites that I frequent often. You will often find me fishing in Deepholm at Deathwing's Fall, fishing for Lavascale Catfish. 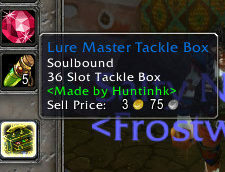 Of course, it's for fish for fish feasts in raids. My other favourite place to fish is Twilight Highlands, and as I have said before, now that they got rid of all those useless Algaefin pools and replaced them all with Deepsea Sagefish pools, I can now get Highland Guppies for feasts and Sagefish for myself. 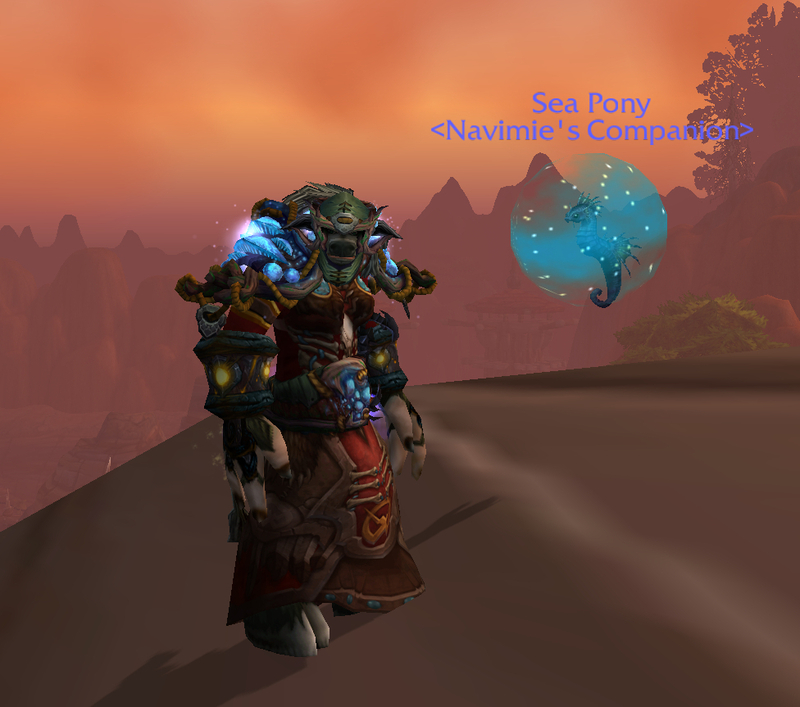 The last place you can find me fishing is off the coastline of Uldum - of course, looking for Fathom Eel pools. It's peaceful, no mobs are going to agro on me while I afk, and of course, there is lovely scenery to be had. Pets, pets, pets! All those gorgeous pets you can get from Fishing, they should have more I think. I would love to fish up some kind of water sprite pet. You know, like a sprite dartling but a water one, you know? I haven't thought much about what I would like to change from fishing. I would like more NPC references. There is one reference to Deadliest Catch in Theramore (so you better go check it out before he disappears!) but I noticed Erinys would like one named after Jeremy Wade in River Monsters. More Deadliest catch references would be good though. I would like to see more clothing enhancements. Fishing overalls would be good. I've got a hat, boots and there are enchants to gloves. Erinys mentioned a boat, which would be a great idea! So there you go, me and my fishing. I love it. Can't wait to level my fishing again (yes I love fishing. I even levelled my hubby's fishing and tried to level Lushnek's fishing too!) 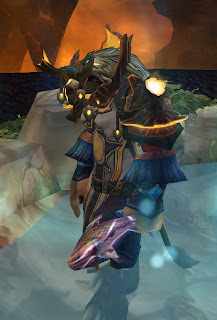 and see what new yummy fish I can catch and cook in Mists of Pandaria. So many people love fishing—I've decided I must be doing something wrong and have vowed to try it again this weekend. I need a break from my break from Loremaster anyways (for values of 'break' of two years or more).